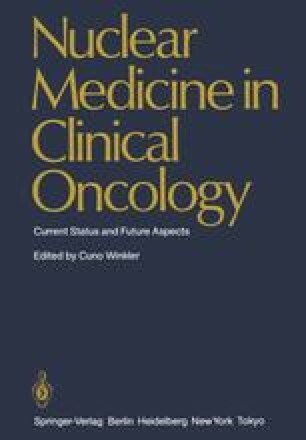 Recently, monoclonal antibody techniques have provided an opportunity to reevaluate the role of nuclear medicine for the diagnosis of malignant diseases by using the immunological approach. The pioneering studies of Köhler and Milstein  made it possible to prepare in vitro immortal cell lines by means of the chemically mediated fusion of lymphocytes from immunized mice and cells from a mouse myeloma tumor. Cloned hybrid cells produce individual monoclonal antibodies in a continuous and virtually endless supply with extremely precise specificity and uniform reaction. To obtain greater specificity in the interpretation of neoplastic masses by in vivo methods, the immunological approach appears to be most promising. About 90 years ago the first attempt to use antibodies produced against malignant tissues was reported by Hericourt and Richet . They prepared antiserum against human osteogenic sarcoma and observed that these sera were effective in the treatment of a fibrosarcoma and a gastric cancer.